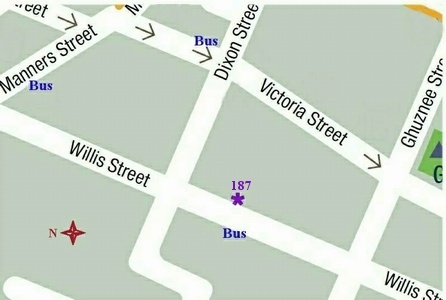 LILAC is at 187 Willis Street, just south of Dixon Street (purple star on the map below). There are a number of bus routes from the Wellington Railway Station and via Lambton Quay, to Willis Street - get off outside Unity Books and walk south. The Kingston (no. 7), Kowhai Park (no. 8) and Aro Street (no. 9) buses turn south off Manners Street into Victoria Street - get off at the first stop just before Dixon Street. There is a bus stop over the road in Willis Street for buses back to Lambton Quay and the railway station. 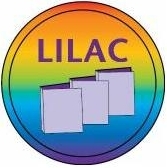 LILAC is on the second floor - take the lift or the stairs and look for the sign. The door into the building is at street level (no steps) but the doorway is only 65cm wide ... until the second door is opened [assistance may be required].